The Darién Gap is one of the more interesting natural locations on earth. It’s an area of forbidding jungle and swampland straddling the border of Panama and Colombia. The terrain of the gap is so treacherous that its expanse marks the only break in the Pan-American Highway’s 19,000-mile length. It’s a land of native tribes and Marxist guerillas (truly a land outside of time — who still wants to be communist?). The Darién Gap is also the setting of today’s film, Indigenous. 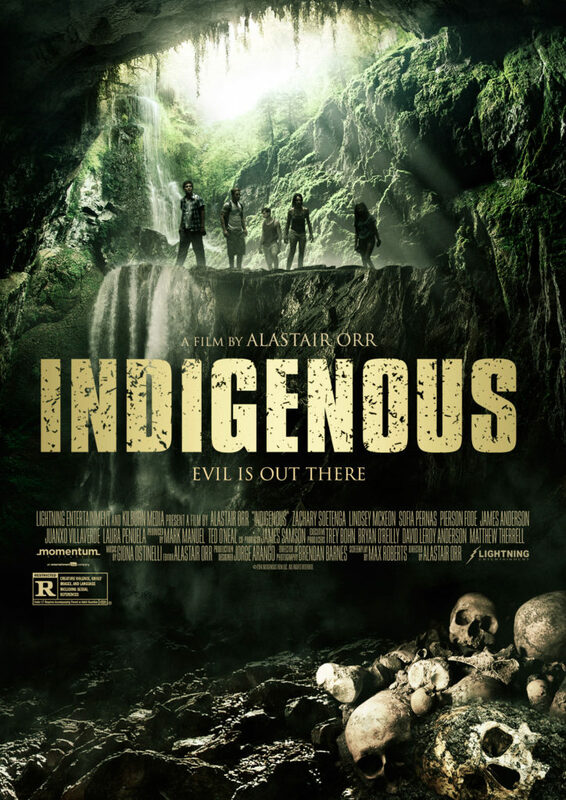 From 2014, Indigenous was directed by Alastair Orr. It stars six attractive young people as American tourists and a local Panamanian, respectively, who, looking for something else to do than surf all day and party all night, decide to venture into the gap to find a natural pool fed by a waterfall. This turns out to be a bad idea. In this film’s universe, the gap has been off limits for years, but not because it’s crawling with Colombian rebels. Oh, no. This ain’t some war movie. This flick isn’t about naïve gringos getting kidnapped and held for ransom. This is a monster flick. The Darién Gap has been closed off because it is home to the mythical chupacabra. The locals believe chupacabra are half beast, half man, with the soul of a demon. Anyone who ventures into their territory does so at the risk of their lives. Our pretty people, in order to make this film, do just that. The setup for the plot in this film was close to being lethal. While the protagonists were at their vacation resort this thing was going nowhere. The cast might be nice to look at, but there are a couple candidates for the Missile Test Wet Paper Bag Club in there. The act before the cast made their way to the jungle was so bad that I held out little hope for the rest of the film. But then the monsters show up. There’s no more originality in this film’s monsters than there is in plot or setup. The monsters themselves look to share a pedigree with the creatures from The Descent or The Cave. But it’s the jungle act where Orr shows his skills as a filmmaker. The monster attacks are shot well and are quite scary. Orr shows that he understands that darkness and not revealing a lot of monster work wonders for building tension. By the time the monsters arrive, night has fallen on the Darién Gap, and our protagonists are mostly unprepared. Their light sources are few and feeble, and they carry with them no weapons or survival supplies. Outside the range of their lights, the monsters stalk about, waiting for openings when they may strike. It really is something how quickly this film goes from very bad to quite decent. It settles back into mediocrity for denouement, but it was still impressive how much of this film Orr was able to salvage. Coming up with something new in the monster subgenre of horror is no easy task. I think the most viewers can expect at this point is for a film with such subject matter to be handled well if it can’t offer something new. Indigenous comes close to being a good example of the genre. It’s the type of horror film that we horror fans will enjoy on occasion, but I don’t expect it will find much of an audience elsewhere.